Virtual staging is the hottest new trend in real estate. This process uses 3-D technology to stage homes. Interior designers pick the best furniture to add to rooms of a home and then use online staging to make it happen. By the time the interior designers are finished, it looks like a completely different house, and it’s ready to catch a buyers’eye. Virtual staging has some unique benefits over traditional staging. Check the benefits out, and then you’ll see why real estate virtual staging is so popular. Then, you can jump in and use the technology to stage your own home. If you use traditional staging, you only have so many options for redesigning your home. Your real estate agent or interior designer will only be able to get their hands on so many different pieces of furniture, so you might not be able to get pieces that potential buyers love. That could put you at a severe disadvantage when trying to sell your home. Real estate virtual staging is quite different, though. You can get your hands on any type of furniture you want since it’s all online. Your interior designer will look at your home, decide which pieces look best, and then make it happen. You never have to worry about hearing, “Sorry, we can’t get that.” If it is available anywhere, it can be used for virtual staging for real estate. As you can imagine, that provides you with a huge advantage in the competitive real estate market. Traditional staging is expensive, which is why so many people don’t do it. It can cost $2,000 or $3,000 just to set the home up. Then, you have to pay rental fees for the furniture. Rental fees might be $1,000 a month (or even more), so if your home languishes on the market, you can end up spending quite a bit of money just on the staging. You can easily be thousands upon thousands of dollars in the hole before you even generate interest for the property. Virtual staging a house is much more affordable. You only pay once, no matter how long the property stays on the market. Also, because the items aren’t physically added to your home, the setup is much more affordable. Instead of paying thousands of dollars, you will pay hundreds in most instances. You basically choose how many photos you want to stage, and you pay per photo. It is much more reasonable. You want to get your home on the market quickly. The idea of having an interior designer come to your house, pick out furniture, and move it in sounds overwhelming. The entire process can easily take weeks. 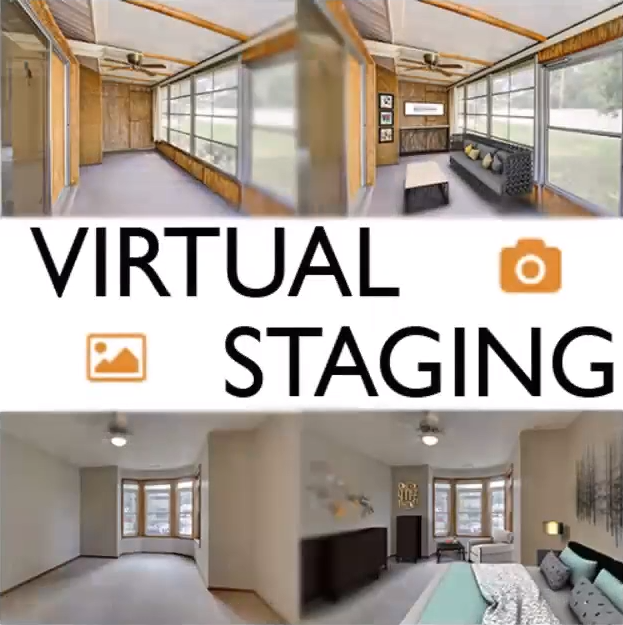 Virtual staging a house is so much faster, and you don’t have to be involved. You don’t have to let in the moving crew, listen to all the noise that comes with moving furniture, or even damage the home by moving furniture into the property. You can just look online and see your perfectly staged house. Some people like to stay in their homes when they’re trying to sell them. If that’s the case, it can be difficult if you use traditional staging. All your belongings will be gone, and you’ll be sitting on rental furniture. That’s not much fun, is it? If you choose virtual staging, you can keep your home as it is, but it will look different online. This makes it so much easier for people who want to stay put while selling their homes. Most importantly, this type of staging allows you to go after your target market, whoever that might be. This process makes it easy to decorate the home in a way that will appeal to the market you’re trying to reach. People from all over the world are realizing that this type of staging is the smart choice. If you want to save time and money, all while making your home appealing to potential buyers, you know that online staging is the way to go.